Principal-In-Charge/Senior Planning Advisor John Lyons with Strand Associates provided an update to the Paducah Board of Commissioners at their February 12, 2019, meeting on the work completed in partnership with the City of Paducah and BFW Engineering & Testing on the second phase of the Comprehensive Stormwater Master Plan. The Plan’s second phase addresses the creation of a Stormwater Utility with an associated Stormwater Impact Fee. The proposed fee is a revenue stream that would be used to fund items such as capital improvement drainage projects, operations and maintenance of the existing infrastructure, the City’s flood protection system (floodwall), regulatory compliance requirements, infrastructure repair and replacement, and the administration of the program through staffing and equipment. Lyons explained that a stormwater utility most often uses an Equivalent Residential Unit (ERU) as a funding mechanism. The ERU is based on the impervious surface on a parcel such as rooftops, driveways, and patios. 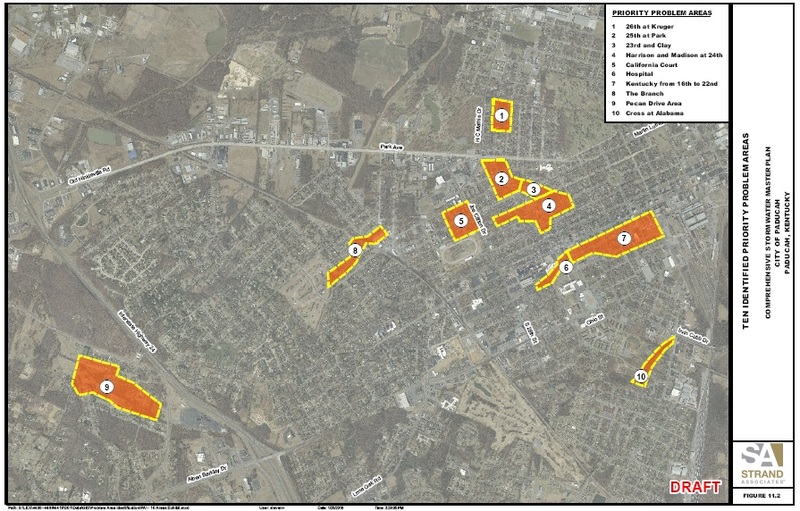 Strand sampled 50 residential parcels in Paducah to determine an average amount of impervious area. The average is 3500 square feet per residential parcel which would equal one ERU. It would be proposed for each residential parcel to pay the same amount per month, one ERU. Lyons proposes the monthly cost per ERU to be $6.13. The proposed fee could generate $2.7 million annually which would be dedicated to stormwater programs, projects, administration, and maintenance. Please note that this is a recommended rate. The Paducah Board of Commissioners has not approved this rate and would like to have additional information about how the rate would impact various businesses, schools, and other entities. Non-residential parcels such as commercial entities would pay a monthly fee equal to the total amount of impervious area on the property divided by 3500 and then multiplied by the proposed monthly rate. The City also could look into developing a credit policy for non-residential property owners that exceeded local stormwater detention and water quality requirements. Strand will be providing the City with the calculated impervious area for each non-residential parcel in Paducah. Stay tuned for details on how individual businesses or non-residential entities will be able to get information regarding the amount of impervious area on their property in order to make total fee calculations. There are approximately 1500 stormwater utilities in the United States with about a dozen of them in Kentucky. In Kentucky, the fees for residential parcels range from $1.50 per month in Murray to $9.90 per month in Louisville. The national average is $5.34 per month. Paducah’s proposed Stormwater Impact Fee includes covering the costs associated with the floodwall which currently are funded through the City’s General Fund. If the floodwall costs remained in the General Fund and were not included as part of the Stormwater Utility, the proposed monthly fee for residential parcels (1 ERU) would be $4.44. As a reminder, the first phase of the Comprehensive Stormwater Master Plan has been completed. The first phase used the July 7, 2015, storm event to create a model of Paducah’s natural and manmade infrastructure including storm and combined sewer systems, topography, drainage basins, and river systems. This computer model along with community input was used to determine flood-prone areas in Paducah. The first phase identified more than $43 million in flood mitigation projects located within ten priority areas. If the drainage projects outlined in the ten project areas were completed, 245 homes in the City would not be flooded with an additional 289 structures seeing a reduction in flooding. Stormwater is the result of rainfall that does not soak into the ground and flows into surface waterways or storm sewers. Stormwater is a concern to the City of Paducah and has to be controlled from a quantity and quality standpoint. Construction activities and increased impervious surfaces associated with new development and expansion of existing sites can lead to increased stormwater runoff and pollution. Storm water management and how the public can help maintain flow into the system are highlighted in this Paducah View episode (6:09 minutes). Following some of the City’s most recent record storm events, residents are encouraged to share their firsthand accounts of flooding on their property and surrounding areas. Residents are encouraged to provide as much information as possible about each event in which flooding was noted. Photos showing the extent of flooding accompanied with the date of the rain event and the address or location of the property will be extremely useful. Public Meeting No. 4 (November 14, 2018): Paducah residents attended a public meeting to provide input regarding the creation of a stormwater utility and associated fee structure. The public meeting was Wednesday, November 14 at City Hall located at 300 South 5th Street. At the meeting, residents learned how the City of Paducah plans to fund ten priority drainage projects and existing infrastructure maintenance through the development of a citywide stormwater utility. The goal of the stormwater utility is to provide a dedicated funding source for the City of Paducah to solve drainage problems, to repair, maintain, and enhance existing storm infrastructure, to provide flood protection, and to comply with federal regulatory requirements associated with water quality. Below is the video from the meeting. In March 2017, the City of Paducah contracted with Strand Associates, Inc. who is being assisted by Paducah-based Bacon Farmer Workman Engineering & Testing, Inc. to complete the Comprehensive Stormwater Master Plan for Paducah. Comprehensive Stormwater Master Plan Phase II Presentation about Stormwater Utility on November 13, 2018, to Paducah Board of Commissioners: Principal-In-Charge/Senior Planning Advisor John Lyons with Strand Associates provided an update to the Paducah Board of Commissioners on the work completed by Strand in partnership with the City of Paducah and BFW Engineering & Testing on the second phase of the Comprehensive Stormwater Master Plan. As a reminder, the first phase of the Comprehensive Stormwater Master Plan has been completed. The first phase used the July 7, 2015, storm event to create a model of Paducah’s natural and manmade infrastructure including storm and combined sewer systems, topography, drainage basins, and river systems. This computer model along with community input was used to determine flood-prone areas in Paducah. The first phase identified more than $43 million in flood mitigation projects located within ten priority areas. If the drainage projects outlined in the ten project areas were completed, 245 homes in the City would not be flooded with an additional 289 structures seeing a reduction in flooding. Comprehensive Stormwater Master Plan Phase I Completion Presentation on October 23, 2018, to Paducah Board of Commissioners: Principal-In-Charge/Senior Planning Advisor John Lyons with Strand Associates provided an update to the Paducah Board of Commissioners on the work completed by Strand in partnership with the City of Paducah and BFW Engineering & Testing on the completion of the first phase of the Comprehensive Stormwater Master Plan. A 29-page draft executive summary document has been provided to the Board which summarizes the activities in Phase I including the public engagement, the development of the baseline model using the flood information from the July 7, 2015 storm event and information from residents, the determination of 23 problem areas for flooding, and the selection of ten of those areas to be priority projects. Lyons said, “As we have built the model, there is no doubt the flooding is widespread in the City.” The draft document also provides a project profile page for each of the ten priority projects. The profile pages include a description of each drainage project and a benefits summary. Lyons said, “The goal of the Master Plan is not to eliminate flooding. The goal is to mitigate flooding, to manage flooding—to find a balance between costs and benefits achieved. It’s a difficult conversation. In a perfect world, no one would flood.” In summary, if the drainage projects outlined in the ten project areas were completed, 245 homes in the City would not be flooded with an additional 289 structures seeing a reduction in flooding. The total cost is approximately $43.3 million. Strand Associates currently is in the process of completing the second phase of the master plan which includes the development of annual operation and maintenance costs and the costs for repair and replacement of existing infrastructure, the projection of future funding needs, funding alternatives and rate options, billing system options, a rate comparison, and a storm water utility ordinance. Residents Invited to Public Meeting No. 3 on July 30, 2018 to Review Comprehensive Stormwater Master Plan Priority Project Areas: Paducah residents are invited to attend Public Meeting No. 3 to review the latest information regarding the development of a Comprehensive Stormwater Master Plan for the City of Paducah. The meeting will be Monday, July 30 from 5 until 7 p.m. at the Paducah Middle School Cafeteria located at 342 Lone Oak Road. To access the cafeteria, please park in the lot at the back of the school and use the rear entry. At 5:30 p.m., the City’s consultant team for this planning initiative will make a presentation about the Master Plan progress, selection of the priority project areas (see below), and development of the flood mitigation alternatives. In addition to the presentation, there will be stations that provide information about each of the selected priority areas including flood mitigation alternatives currently under review. Project team members will be available to answer questions. Over the past several months, the City’s consultant team has worked to create an existing conditions baseline model of Paducah’s natural and manmade infrastructure including storm and combined sewer systems, topography, drainage basins, and natural stream systems. To replicate how rainfall affects this area, the baseline model was calibrated using the flood information and accounts from residents regarding the record July 7, 2015, storm event. This computer model, in addition to feedback collected from previous public meetings, an online survey, and historic citizen complaint data, was used to determine the flood-prone areas in Paducah and to evaluate approaches and alternatives to mitigate the flooding that are currently under review. The consultant team also has worked with a citizen advisory group, the Storm Water Advisory Committee (SWAC), to solicit feedback on the priority areas, mitigation options, and level of service to be used for sizing alternatives. General cost and design differences for levels of service ranging from 10-year, 25-year, and 100-year storm events were also shared with the SWAC to help inform decision making that led to the selection of a 25-year storm event as the basis of design. Using a 25-year storm event as the design basis, the cost to complete the flood mitigation projects in the ten priority areas is estimated to be in the $32 to $36 million range. These projects could potentially eliminate 180 primary structures (such as homes and businesses) from flooding and greatly reduce the flooding risk for another 300 primary structures within the Paducah city limits. This is the third public meeting for the Master Plan process. The previous meetings were held in 2017 on June 19 and November 13. Residents have had opportunities to share storm water flooding-related experiences and firsthand flooding accounts, photos, and concerns in addition to ideas to help solve community-wide storm water issues. In March 2017, the City of Paducah contracted with Strand Associates, Inc. who is being assisted by Paducah-based Bacon Farmer Workman Engineering & Testing, Inc. to complete the Comprehensive Stormwater Master Plan for Paducah. The master plan development is on schedule with the first phase wrapping up and the second phase initiated. The second phase of the Master Plan includes evaluating funding mechanisms to allow the implementation of drainage improvement projects in addition to water quality protection, operations and maintenance, and rehabilitation of aging storm sewer infrastructure. Comprehensive Storm Water Master Plan – Phase I and Phase II Update (July 10, 2018): Principal-In-Charge/Senior Planning Advisor John Lyons and Professional Engineer Steve Vogel with Strand Associates provided an update to the Paducah Board of Commissioners on the work completed by Strand in partnership with the City of Paducah and BFW Engineering & Testing on the Comprehensive Storm Water Master Plan. The master plan development is on schedule with the first phase wrapping up and the second phase initiated. Vogel then showed the Board a few of the project areas and design options to address flooding. Using a 25-year storm event to design the projects for the ten areas reduces the estimated total cost to approximately $32 to $36 million. These projects could eliminate 160 to 180 primary structures (such as homes) from flooding and greatly reduce the flooding risk for another 275-310 primary structures within the Paducah city limits. Over the next few months, Strand will be reviewing the amount of impervious area in the Paducah area to help develop a recommended ERU. Items included in this second phase of the master planning process include the development of annual operation and maintenance costs and the costs for repair and replacement of existing infrastructure, the projection of future funding needs, funding alternatives and rate options, billing system options, a rate comparison, and a storm water utility ordinance. There will be intensive community outreach and engagement efforts. Agreement for Phase II of the Comprehensive Storm Water Master Plan (March 13, 2018): The Paducah Board of Commissioners approved an ordinance for an agreement for technical services in an amount not to exceed $257,040 with Strand Associates, Inc. for Phase II of the Comprehensive Storm Water Master Plan project. Phase II develops a storm water program funding strategy. Some of the items included in Phase II are the development of annual operation and maintenance costs and the costs for repair and replacement of existing infrastructure, the projection of future funding needs, funding alternatives and rate options, billing system options, a rate comparison, and a storm water utility ordinance. Phase II will include a public outreach program regarding a potential storm water utility fee. Phase II is anticipated to be completed by the end of January 2019. Since March 2017, Strand has been working with the assistance of Bacon, Farmer, Workman Engineering & Testing to complete elements of Phase I. That phase will be completed this spring with the City receiving a Master Plan report in addition to the identification of ten priority flood areas, the analysis of 30 flood mitigation alternatives, and a prioritized ranking with a cost analysis. Presentation to Paducah Board of Commissioners regarding Problem Area Identification (December 12, 2017): Principal-In-Charge/Senior Planning Advisor John Lyons and Project Manager Michael Woolum with Strand Associates provided an update on the work completed by Strand in partnership with the City of Paducah and BFW Engineering & Testing on the Comprehensive Storm Water Master Plan. The master plan development is on schedule. The agreement with Strand for this plan was adopted by the City Commission in March of this year. Woolum emphasized that developing a Comprehensive Storm Water Master Plan is challenging for Paducah due to several factors including several watersheds, the Ohio River and river flood influences, the floodwall and pump stations, flat topography in the City with steeper topography outside the City limits, and a complicated combined sewer system. Over the past few months, Strand has been using a variety of data sources and information submitted by citizens electronically and from the two Public Meetings held in July and November to create an existing conditions baseline model of the Paducah area. Extensive public outreach was initiated in order to gather the vital data including the two public meetings, online survey and email access, news releases, social media posts, and 700 flyers. The baseline model is a critical piece of this project since the model will be used to evaluate a range of flood mitigation alternatives and costs. The baseline model was calibrated using the flood information from the July 7, 2015 storm event to replicate how rainfall affects this area. Woolum says the 2015 storm was a 100-year storm event. In reviewing the data, Strand has identified 23 problem areas in Paducah. Using the baseline model and a 10-year storm event, 75 structures would flood. For a 25-year flood event, 208 structures would experience flooding. For the July 7, 2015 event, 416 structures experienced flooding. Woolum then pointed out specific information on some of the problem areas. One example is the three adjacent problem areas at 25th at Park Avenue, 23rd at Clay Street, and Harrison and Madison at 24th Street. For a 10-year storm event, a total of 37 structures would experience flooding. As a comparison during the 2015 event, 133 structures experienced flooding. Another example problem area is along Buckner Lane. For a 10-year storm event, a total of 6 structures would experience flooding. As a comparison during the 2015 event, 32 structures experienced flooding. The next step in this phase of the Master Plan process involves reviewing the 23 problem areas and establishing ten priority areas for evaluation. The selection criteria to narrow the focus to ten priority areas will use information such as the number and concentration of structures flooded, property damage complaints, public safety concerns, flood frequency, problem area interdependency, and complexity. Strand will then evaluate flood mitigation control options and prepare preliminary cost estimates for the ten priority areas. This process also will lead to a discussion of the concept of “level of service.” Lyons explained that the level of service is determined by the type of storm or storm frequency around which we want to design flood controls. Since it is not an option financially for a city to be able to prevent all flooding during a major storm event such as what Paducah experienced in July 2015, the City must work with the community to determine the appropriate level of service. The final discussion involved the second phase of the master planning process. The scope of services in the second phase will be presented as a contract with Strand at an upcoming Commission meeting. The second phase focuses on determining costs to implement a Storm Water Management Program including an operation and maintenance budget, a budget for capital improvement projects, staffing, and equipment needs. This also would include the development of a Storm Water Utility and the development of a funding mechanism using an Equivalent Residential Unit (ERU) which is based on the impervious area of parcels. If the second phase contract is approved, it would involve a public outreach program to gather input about a Storm Water Utility and educate the public on the structure of a funding mechanism. Public Meeting No. 2 (November 13, 2017): Paducah residents and those who live near the city limits were invited to attend Public Meeting No.2 to support the completion of a Comprehensive Storm Water Master Plan for the City of Paducah. The meeting was held Monday, November 13 from 4 until 7:30 p.m. at the Robert Cherry Civic Center located at 2701 Park Avenue. The City’s consultant team made a brief presentation about the study progress at 5:45 p.m. The City’s consultant for this planning initiative talked with residents and property owners regarding storm water flooding issues that have recently affected homes and businesses throughout the community. Residents viewed maps and digital imagery showing the extents of flooding from a significant rainfall event. Residents were asked to review the “draft” flood maps that have been developed to replicate the community flooding that occurred from the July 7, 2015 storm event. Since the map reflects modeling efforts underway to recreate Paducah’s natural and manmade infrastructure including storm and combined sewer systems, topography, drainage basins, and river systems, residents are encouraged to provide feedback on the map’s accuracy. At the meeting, terminals were set up so that residents could provide information directly to the engineers and technical consultants who are actively studying Paducah’s flood prone areas. The information assisted the engineers in further refining the scope and extent of flood areas. Once the existing conditions baseline model is completed, the team will evaluate a range of flood mitigation alternatives and costs. A recommended plan and priorities will be presented in the future. The City of Paducah will be evaluating funding mechanisms to implement drainage improvement projects in addition to water quality protection, operations and maintenance, and rehabilitation of aging storm sewer infrastructure. Public Meeting No. 1 (June 19, 2017): Paducah and McCracken County residents were invited to attend Public Meeting No.1 to support the completion of a Comprehensive Storm Water Master Plan for the City of Paducah. The meeting was held June 19, 2017 from 5 until 7:30 p.m. at the Robert Cherry Civic Center located at 2701 Park Avenue. The City’s recently hired consultant for this planning initiative talked with residents and property owners regarding storm water flooding issues that have recently affected homes and businesses throughout areas of the community. The consultant team made a brief presentation to the public to provide additional background on the study process at 5:45 p.m. Residents were able attend the meeting anytime between 5 and 7:30 p.m. Following some of the City’s most recent record storm events, residents were encouraged to share their firsthand accounts of flooding on their property and surrounding areas. At the meeting, terminals were set up so that residents could provide information directly to the engineers and technical consultants who are actively studying Paducah’s drainage basins, topography, and flood prone areas. Approximately 65 Paducah and McCracken County residents attended this meeting. Agreement with Strand Associates, Inc. for Comprehensive Storm Water Master Plan (February - March 2017): At its March 14, 2017 meeting, the Paducah Board of Commissioners approved an ordinance to execute an Agreement for Technical Services with Strand Associates, Inc. in an amount not to exceed $790,000 for professional engineering, consulting, and related services for the development of a comprehensive storm water master plan (CSMP). Strand is partnering with the local firm, BFW Engineering & Testing, Inc. The CSMP will provide the City of Paducah the identification of ten priority flood areas, the analysis of flood mitigation alternatives, a prioritized ranking of projects along with a benefit cost analysis, and the development of a capital project program. The CSMP process has an anticipated completion date by the end of 2018. The previous storm water study was completed in 1989 and looked at only five flood-prone areas. From May 20 until June 17, 2016, the City of Paducah solicited a request for qualifications from experienced consulting engineering firms for the development of a CSMP. Six firms submitted their qualifications. A selection committee comprised of City Engineer & Public Works Director Rick Murphy, Storm Water & Drainage Engineer Eric Hickman, Joint Sewer Agency Executive Director John Hodges, and Paducah Economic Development President/CEO Scott Darnell reviewed and scored each submission. Firms were given the opportunity to make a presentation to the selection committee with three firms making presentations on August 4. After the review and presentation process, the selection committee unanimously recommends Strand Associates, Inc. Strand has been in existence since 1946. It has 380 employees and 11 offices including two in Kentucky. Strand has extensive experience in community and storm water modelling and master planning. Principal-In-Charge/Senior Planning Advisor John Lyons and Project Manager Michael Woolum with Strand Associates in addition to Assistant Project Manager Kenny McDaniel with BFW made a presentation about the project at the February 28 City Commission meeting. Woolum said that Strand is committed to determining meaningful improvements to the flooding problems that the Paducah community is facing. Over the past few months, Strand has been researching the Paducah area to understand the areas of existing flooding, rainfall data, existing storm water conveyance systems (both natural and manmade), and topography. To create an effective CSMP, Strand will study several factors unique to the Paducah area including the characteristics of the local watersheds and the potential for future growth. Computer models will be calibrated based on actual events with a design around specific storms and rainfall rates. The CSMP will recommend the appropriate level of flood control and cost-effective solutions. Strand proposes to have public meetings throughout the process to provide citizen outreach and to manage the public’s expectations through education. Lyons said, “This project/program is not intended to eliminate flooding. This is about risk management.” Lyons said the project team will be working with the City and other partners to determine the appropriate level of service in managing the storm water. That will lead to the development of feasible, cost-effective solutions. Lyons added that you have to understand what you have today regarding existing storm water conveyance systems and then look at how to optimize their function. Comprehensive Stormwater Master Plan Request for Qualifications (Deadline was June 17, 2016): From May 20 until June 17, 2016, the City of Paducah solicited a request for qualifications from experienced consulting engineering firms for the development of a Comprehensive Stormwater Master Plan (CSMP). The overall objective of this project is to compile a document which provides clear and concise explanation of the City’s existing stormwater management program, presents a detailed investigation into key components of stormwater as it is related to the City, establishes stormwater management goals for the future, presents tools to meet or exceed established goals and provides a foundation for future policy decisions. Storm Water System Plan Proposal (February 16, 2016): City Engineer & Public Works Director Rick Murphy made a presentation to the Paducah Board of Commissioners about the City’s existing storm water system and its limitations, the need for an updated storm water master plan, and an overview of possible funding structures. Murphy explained that the majority of the drainage problems in the City originate from the natural geography of the City since Paducah is located on the Ohio River’s floodplain. He adds that nearly 204,000 square miles of land drain to Paducah. Paducah has 110 miles of storm sewer and 69 miles of combined sewer. Much of the city’s development occurred at a time when storm water management was not a priority and the current development ordinances were not in place. Therefore, Murphy says the current storm water system is aging and over capacity and needs to be upgraded and/or replaced. The majority of the storm sewers are 60 to 100 years old. The City provides approximately $60,000 each year to fund storm water management which Murphy says is insufficient. Murphy recommends the development of a holistic storm water master plan. The most recent study was completed in 1989 and looked at only five flood-prone areas. A storm water master plan would study and model the existing storm water management system in detail, establish project goals, and prioritize projects. The master plan also would look at possible ways to fund system upgrades. Murphy outlined the possibility of creating a Storm Water Utility. Most storm water utilities use the Equivalent Residential Unit (ERU) as their method of funding. Using the ERU method, a property would be charged a monthly storm water fee based on its contribution to storm water runoff which is directly related to the amount of impervious surface on a property. Murphy showed a chart listing ten Kentucky communities that have a monthly fee ranging from $1.50 to more than $7.00 to fund their storm water utilities. The average is $3.60 per month for residential properties. Nationally, there are 1491 storm water utilities with a median storm water utility fee of $3.50 per month. City Manager Jeff Pederson says this is basically a proposal to create a storm water utility, a new division of the Engineering-Public Works Department, with a dedicated source of revenue. Pederson recommends moving forward with the development of a request for proposals (RFP) to solicit interest from companies that would be able to develop a storm water master plan for the City of Paducah which would provide guidance on drainage projects and funding. The Board of Commissioners voiced their support in moving forward with the RFP.